Fairy tales, myths and legends made the Dwarf a familiar figure long before Thorin Oakenshield and Company made their appearance in the novel version of The Hobbit in 1937. For instance, Dwarves play a prominent role in Snow White and appear to share some of the characteristics of Thorin’s people, like their mining profession and their fascination with wealth. But the word ‘Dwarf’ is in fact much older than the fairy tales in which it seems to have been preserved. It is related to the Old Norse word ‘Dvergr’ but, despite its Scandinavian origin, it has entered the English consciousness through Snow White and other tales like it that few children grow up without encountering. When it comes to the Dwarves that appear in The Hobbit, however, Tolkien is without doubt harking back to the older source material. The evidence for this comes from the Dwarf names, which Tolkien found in the poem Voluspa, ‘The Sybil’s Vision’, one section of which is called the Dvergatal, ‘The Tally of the Dwarves’. Eight of the thirteen names of Tolkien’s Thorin and Company are here, along with the name of Thorin’s relative Dain, his grandfather Thror and something close to his father Thrain. Four of the other five (Dwalin, Gloin, Dori, Ori) are not far away, as are Durin – in both The Hobbit and the Voluspa the Dwarves’ legendary ancestor – and even Thorin’s nickname Oakenshield, or ‘Eikinskjaldi’! In Middle Earth, Dwarves dwell in mountains and hills, delving great halls and mansions underground, where they work at their forges and build treasure-vaults to hold their wealth secure. They have a love of craftworks – particularly the things they make by hand, and of silver, gold and mithril – often scorning marriage and other pursuits to devote themselves to their craft. Other races hold them in great regard for their skill as smiths, miners, jewellery-makers, carvers and even toy-makers. But this love of wealth and made things often turns to greed and desire, for gold often holds dominion over the minds of many Dwarves. They are a secretive people, protective of their privacy, and dislike others knowing their business. Dwarves thus rarely mingle with other races, and keep to themselves most of the time – except when it comes to trade. In particular, they guard their women and children with fierce jealousy and protectiveness. In all the chronicles of the Dwarves, only one Dwarf-woman is even mentioned: Dis, Thorin’s sister and mother of his nephews Fili and Kili. Whilst vindictiveness, avarice, ingratitude and foul nature have led a few Dwarves to ally themselves with the Enemy, this is not so many as the tales of greedy and jealous men would have it. Most Dwarves in fact hold the forces of evil, particularly Orcs and Goblins, as their direst foes. Although Dwarves, unlike Orcs or Hobbits say, are not Tolkien creations, they are certainly a very different creature today from their fairy tale equivalents – more rounded, more earthy and ultimately more realistic. They have a distinctive way of speaking – characteristically taciturn, not unlike the Norsemen whose language Tolkien assigned to them. Subliminally or otherwise, this mode of speech seems to have infiltrated the fantasy fiction of other writers in whose works Dwarves make an appearance. The Tolkien influence is pervasive, for instance, in Alan Garner’s Weirdstone of Brisingamen. When Fenodyree the Dwarf tells the children, as they crawl through the tunnels: “so deep did men delve that they touched upon the secret places of the earth…There were the first mines of our people dug, before Fundindelve: little remains now, save the upper paths, and they are places of dread, even for dwarfs” he is clearly channelling the spirit of Tolkien. 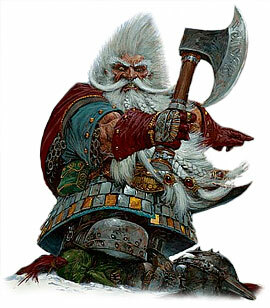 Doli, an important Dwarf character in Lloyd Alexander’s Chronicles of Prydein, could almost have been taken, beard, axe and all, straight from the pages of a Tolkien novel – as could, incidentally, Guy Gavriel Kay’s Matt Soren, who appears in The Fionavar Tapestry, written many years later. Even the Dwarves who appear in C S Lewis’s Chronicles of Narnia – written and published almost contemporaneously with the Lord of the Rings trilogy – owe a clear debt to Tolkien. It is notable that – with the exception of Kay’s trilogy (which is, after all, now almost thirty years old) – the books mentioned above all seemed to be aimed more at children than at the adult end of the fantasy market. Dwarves are also, of course, a staple of Warcraft, Warhammer, Dungeons & Dragons and any number of other role-playing games, as well as their tie-in novels (e.g. William King’s Gotrek & Felix). Does this mean, then, that today the Dwarf is a figure fit only for children’s books and game adaptations? I personally do not think that this necessarily follows, but rather it is simply a trend that is more likely a symptom of the more general tendency in ‘grown-up’ fantasy to concentrate on humans and their machinations. Not only Dwarves, but Elves, Gnomes, Trolls, Ogres, Orcs and all sorts of other creatures rarely appear in ‘serious’ fantasy novels these days and, in my view at least, the genre is all the poorer for it. It is perfectly possible to have real, believable, multi-dimensional characters who are not human. Thorin and Gimli both go on personal as well as physical journeys in their respective stories – they grow and change just as convincingly as any of their human (or Elf or Hobbit) counterparts. As ever, the most important thing in any book – whatever the genre – is that its characters are well-written and sympathetic, or at least empathetic. After a brief, final flowering in the Fourth Age, Tolkien’s Dwarves ultimately diminished and disappeared from the world of men that followed. I can only hope that the same thing does not happen to their counterparts in the worlds of fantasy fiction. Nice post, and I agree completely. I love the mythic characters. (Well, the well written ones anyway.) I use them in my own writing, even a sci-fi I recently finished. Simultaneously working with and against the stereotypes is a lot of fun. I found this very interesting to read. Nice summary! I always enjoy these! If I remember my Morse mythology, the distinction between dwarf and dark-elf is a bit vague at times nor is he really depicted as a short, stout fellow (although the love of gold and magic/machines is very old). They’ve never really appealed to me personally but I do take that route with them in a setting I’m using for current writing. As a very long time D&D player and more recently an MMO player, it’s interesting to see inidividual’s views on taking a swarf as a character. Teenage and younger players seem willing to try anything (even cow-people Tauren in WOW :)) but most adults seem to settle into a narrower range of characters. Among adults, there still a mix but here you seem to find a good portion who would never play a dwarf (count me in that group), some in them iddle a few who love them. I think it’s a manifestation of whether the person appreciates more physical aesthetics (in which case they may go more for human or elf) or the iron-will and strength (in which case dwarves can appeal).